Keep your explanation of the home marketing and selling process simple. Get your presentation into the hands of as many homeowners as possible. Never underestimate the persuasive power of well-written client testimonials. Would you like to convert more leads to signed, salable listings? Then stop giving in-person listing presentations. A pre-listing presentation is more effective than giving an in-person listing presentation. Here’s how to create one that will attract and convert more leads. Let’s think about the results of the research the National Association of Realtors (NAR) conducts in its annual Profile of Home Buyers and Sellers. What they have discovered is that, year after year, the number of homeowners who interview only one or two real estate agents increases. The most recent survey revealed that 70 percent of homeowners only interview one agent before listing their home, and 87 percent of homeowners will interview two agents before selecting someone to work with. If you’re not no. 1 or no. 2 in the minds of homeowners in your target market, you might as well be out of business! Your job is to get in front of as many homeowners as possible, as often as possible, so that they remember your name when they are ready to sell. A pre-listing presentation enables you to get your proven approach to marketing homes into the hands of homeowners before they are ready to talk with agents. This places you ahead of the competition. You are able to communicate your unique value proposition, or why sellers should hire you over the competition. The pre-listing presentation enables you to present sensitive information about price and condition before meeting the seller face-to-face, allowing the seller to fully absorb the information. A pre-listing presentation shortens the amount of time required for the in-person appointment. A pre-listing presentation makes converting the appointment to a signed, salable listing much easier. As much as I’d like to be able to take credit for the idea of this pre-listing presentation, I can’t. Many years ago, I met a guy named Jim Nelms at a cocktail party. We started talking and the conversation led to our work. When he asked what I did, I responded that I had just sold a company and was starting a real estate brokerage. His questions probed further, asking if I’d ever considered doing any research on what motivates homeowners to choose one agent over another. I politely told him that I had a pretty good idea, but his next comment hit me like a lightning bolt! I was sold. Well, until I heard the price. But after a few days, I realized it would be a smart investment; I bit the bullet and wrote the check. What you’ll see below is the result of $18,000 in research. I used the resulting presentation to not only generate leads, but to convert well over 90 percent of those leads to signed listings. Naming your pre-listing presentation is one of the most important aspects of its design. If you want people to become interested in your services, you have to focus on their needs — not your own. So, calling my presentation “Greg Lyles’ Listing Presentation” probably won’t generate much interest. Think like the homeowners think. What do they want? What’s important to them? Once I had selected my niche market and identified what was important to them, I knew they wanted results. Your introductory letter should briefly state your appreciation for the opportunity to present your proven approach to marketing homes. The letter is used to frame the remainder of the presentation. It lets homeowners know that you understand what is important to them, and it reassures them, upfront, that they can expect these services and results if they hire you. Also, spring for a decent photo of yourself. I really recommend getting a great lifestyle photographer to take a photo of you. Something that looks approachable and reflects your personality is always preferable to stiff, formal head shots or pictures of agents holding their dog or cat. The image above is a great example of the kind of personable, warm photo you want in your pre-listing presentation. Your track record of results, along with your client testimonials, will do more to establish your credibility and expertise than anything else you can communicate to the seller. When presenting your personal statistics, limit them to a single item per page. Following this design will strengthen the impact of each statistic and eliminate the confusion of multiple charts or graphs on a single page. By selecting an appropriate chart style to communicate your results and summarizing what the graph means in your subhead, you ensure the reader will understand what you are sharing. Always provide the source for your statistics. This could be your local multiple listing service (MLS). If you don’t have a track record yet, talk with your broker about using the office’s track record of results in your selected market until you can develop a track record of your own. Just be completely transparent by stating that the statistics represent what your office has accomplished compared to the market averages. 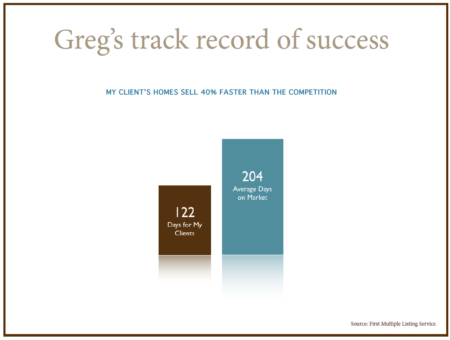 Always compare your track record to that of the “typical agent” in your market. This creates doubt in the mind of homeowners about any other agent they may be considering. Plus, nobody wants typical results and service — they want superior results and service. Also called “social proof,” testimonials provide potential clients with the assurance that other homeowners have hired you and have realized excellent results. This means the more well-written testimonials you can provide, the easier it will be for you to turn appointments into signed listings and obtain higher commissions! Just remember to use those testimonials to demonstrate how your services helped other sellers realize their goals. As agents, we have a tendency to believe everyone understands how buyers evaluate homes and how homes are sold. I sold homes for some really smart and successful people, but they were smart and successful in fields other than real estate. Through the research that was conducted on my pre-listing presentation, the design feature that generated the most positive response was first explaining how buyers will evaluate homes and then by explaining how I would help the seller position their home to stand out from the competition. It is very important to keep your explanation of the home marketing and selling process as simple as possible. Anyone can make the process sound overwhelming and complex and present himself or herself as the only agent capable of understanding how to navigate the homeowner through the sale. Leonardo da Vinci said, “Simplicity is the ultimate sophistication.” Listen to Leonardo. The research revealed that when the process was described in very simple terms, sellers understood it more completely and were more receptive to my approach. The marketing I will do to promote your home has only one purpose — to increase awareness among potential buyers and their agents, driving traffic to your door. Once the buyer reaches your door, the job of marketing is over. Now your home has to compete with other available homes on the balance of two items: features and price. If your home has more features that appeal to buyers or if it is priced lower than comparable homes, your home will stand out as the better value. Conversely, if your home lacks the features that potential buyers desire, your only option is to compete on price. To be effective, your home should stand out as one of the top two to three best values in your immediate marketplace. Then, explain what influences price and how you will help them arrive at an accurate asking price for their home. Explain how, through staging and repairs, you will help present the home to its best advantage. One of the biggest mistakes I see agents make is providing too much detail about how they plan to market the homes they list. What I found, through the research that helped to shape my pre-listing presentation and my experience using it for over a decade, was that if you present your track record and testimonials correctly, you don’t have to explain how you will accomplish the end results. Think about it this way: When you go to a doctor for surgery, do you ask who makes the equipment they will be using? Do you inquire about the software they’ll use to process your insurance claim? You trust the doctor based on his or her track record and maybe because you were referred by someone you know and trust. Simply let the homeowner know that the listing will be promoted aggressively for maximum results, and provide a few examples. Taking the time to create an effective pre-listing presentation won’t just help you convert leads to appointments and signed listings. It can be used very effectively to generate leads. What if you could get your presentation into the hands of hundreds, if not thousands, of homeowners every few weeks? If you want to become a top-producing agent, your goal should be to get your presentation into the hands of as many homeowners as possible. It always seemes to me that most agents approach this backwards. They advertise so they could get leads. Then they attempt to convince the homeowner to meet with them so they could give their listing presentation. How would that work in other businesses? What if famous novelist John Grisham called you at home and asked if he could come over and read part of his newest book to you in hopes you would buy it? So, I found a way to get homeowners to request my presentation, and they started calling me when they were ready to sell. Once they called, they were already sold on hiring me. They had everything they needed to understand the process, they knew how I would position them for a successful sale and they knew my track record and testimonials. I never had to cold call or door knock, yet I had a constant flow of well-qualified leads. You’ll stand out from the competition and win more listings if you take the time to identify the unique wants and needs of your target audience and create a pre-listing presentation that addresses how you are uniquely positioned to help them achieve their goals. Get your free copy of “The Ultimate Guide to Pre-Listing Presentations” here.